...Consider this: If the city of Minneapolis owns a property that they spent $20,000 to acquire, and that they will spend another $20,000 to tear down, what should their asking price be if someone expresses interest? Should they essentially give it away, since it has no real value? Should they attempt to recoup some acquisition and holding costs, but ultimately sell at a discount? Should they appraise just the land, and sell for that amount? Or should they insist upon getting an appraisal and selling for that amount, even if sticking to their guns means no one will buy the house and it will eventually be demolished? In the real world, placing a demolition order on a structure you own is akin to a prima donna athlete declaring he'll never play for his team again and demanding a trade, or like a Kardashian marriage that comes with a pre-nup; it's clear to everyone else that the item in question has no real value to the person footing the bill. But in true Orwellian bureaucratic logic, the city's policy (or state law; I've been told differently about what the driving faction of government is here) says that properties must be sold for their appraised value. The breakdown of financial logic comes when we realize that up until the point someone gets a property at a discount, the expenses are only the acquisition and holding costs. If it's torn down, we pay the demo fee, we lose the tax base, at least temporarily, and new construction is heavily subsidized. That difference in the city's budget could exceed $150,000 per property. And yet houses that could be paired with a buyer are being torn down. It's not all Bizarro-World thinking though. Let's hypothesize that Minneapolis just turned over its vacant housing stock to the Nicole Curtises of the town. And then a group of slumlords might come along and posit that, legally, there is no difference between Mahmood Khan bringing a property back up to code, mismatched windows, and Neapolitan siding, and all, vs. Nicole Curtis doing nationally-celebrated restoration. This cadre of problem property owners looks at the racial disparity between home owners and renters, and presto! Discrimination lawsuit full steam ahead. Just defending against such a complaint could potentially offset whatever budgetary gains the program had realized. That's no reason to accept the status quo; it just means that there is a reason behind why the policy is that way, and a good solution will entail working around that particular obstacle. And therein lies the demolition problem. We have properties that are being torn down. We have good rehabbers who could take these properties on instead. And these houses still wind up in a landfill. Keep tearing them down!! That way the values of the remaining houses should rise (supply and demand)and people that are upside down on their mortgages now will stay instead of bolting for the Burbs. We already have 450+ vacant lots on the North Side, how much has your property value risen? 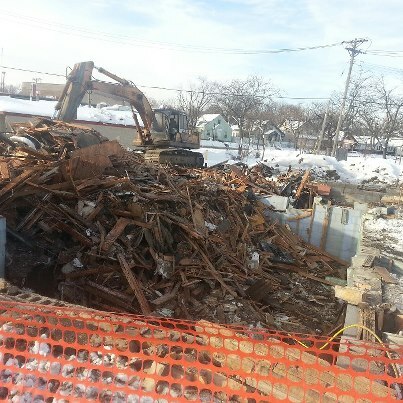 The North Side currently has around 450 vacant lots. Since the Homes on these lots didn't just disappear we can assume that the City tore them down using federal funds earmarked at economic recovery. 450 times $20K = $9,000,000 we have already spent on demolition of our community. We currently have 130 vacant and Boarded Homes in the Jordan community alone. If you were to multiply these 130 by a demo cost of $20K (which is very low) that's $2,600,000 just to create empty lots. Now, think about what it will cost to build new homes. Since all new construction using federal funds must meet absurd LEED standards for the health and energy we can't afford, there are NO private developers willing to finance new home construction on these lots. So, with 450 vacant lots in the North side (and we will just add in Jordans 130 VBR Homes) that makes 580 reconstruction projects to bring the Northside back to what it was 10 years ago. Build 580 homes at $182K = $105,560,000. $117,160,000 of public funding in North Minneapolis to repopulate our community with some pretty damn ugly houses earmarked for additional low income residents to live in structures that will likely not last 25 years. This amount doesn't even include the $MILLIONS$$ being waisted by our local government bureaucracy on wages and salaries needed to perpetuate this fraud on local taxpayers. God forbid that some enterprising contractors rebuilding relevant single family market rate housing might make a few bucks! What's stopping someone from buying the vacant lot and putting up homes without federal funds? Better yet, let's talk about the neighborhood residents themselves who are at least partially to blame for this behavior in 2 ways: 1) Fighting development that is higher density than a SF home that could increase neighborhood density (tax base) and allow for more people, improving the local business climate. This is done at zoning variance approval meetings, neighborhood meetings, etc. And 2) there are many people who have historically and still want dilapidated structures to be torn down and clamor for it to their local government. People cannot assume that every rehabber is a Nicole Curtis, in fact odds are they're the exact opposite. People are more optimistic that a new developer will do a better job on a property than a likely slum lord would. I love Nicole's work but there also has to be blame on ourselves. The rules and beuracracy the government has was in RESPONSE to NIMBY and irrational citizen responses, not some Orwellian overlords forcing this. 1. What is stopping many private developers? - Cost and Resale Value. 2. Most local residents are not fighting higher residential density - they are fighting the clamor of non-profits and the City to install higher densities of poverty within our community. A. She isn't greedy and expect exaggerated profits. B. She takes what others won't or can't do. C. She embraces the current housing form and updates necessary improvements to provide homes that fit the areas lifestyle. 3. Your right, We are to blame for allowing the Cities bad planning attempts to create a low income non-profit paradise and for accepting such low standards for ourselves. i could save the city some money on demolition!!!! suppose they would give the homes away to be moved off the property? i sure could use a home on my property. moving a home would be cheaper for me than building a new home. Years ago we saw the same thing happen in Columbus, Ohio and Cincinnati. When the insurance companies, lawyers, etc. began to group doctors together under the guise of, well, if you're not in this group we're dropping you from the insurance, those doctors all left and went to New Albany, Ohio. Those that ran Columbus were livid and tried and tried to make those doctors come back but those doctors told them where to put it. In a place within Cincinnati, Ohio called Over the Rhine, crime is so bad that at night the police won't even go into it and each night there are multiple murders that take place. In the daytime the police only go in a block or so but then residents begin shooting at them with guns all over the place. It's mostly a black community where you're either trapped by the thugs or you are the thugs. The people there, under the guise of historical ethnic significance have kept the city from bringing down the big abandoned deteriorating buildings. This is where most of the squatters are drug lords, criminal outfits, and just plain people who are not even supposed to be in our country. Drive through there during the day and it's a ghost town for all intents and purposes. All around that area is some growing prosperity and a movement that has been rehabbing 1800s and 1900s buildings, Price Hill being one of them. It's an eerie feeling to drive through the newer portions of the city of Cincinnati and see nothing but either abandoned homes or empty lots where houses were torn down. That was the highest crime area until the mayor decided to jack up the tax rates on housing so high that everyone just bailed out of their homes and went elsewhere. Many went to Blue Ash which today is a thriving city. Those people left with all of their money and Cincinnati was left without tax revenue but it seems that no matter if it's Columbus or Cincinnati, that those who are there to run things and fight to keep unsafe buildings from being torn down or rehabbed are predominately black. The Black History Museum is down there in Cincinnati, Ohio! Oprah Winfrey herself has been down there many times but yet she's said nothing of the ghost town parts of Cincinnati or the plight of those trapped in the black gangster neighborhoods. When the people left and went to other places like Blue Ash and Mason, certain types of crimes followed them. Home robberies were no good in a ghost town. I'd tell you that there is a dedicated effort I've seen talked about repeatedly over the years online and other places that a certain ethnic population was being used to take over the big cities of our nation in order to get control over our nation. In fact a man who told me he was Hezballah said he'd been brought here for that same cause by Americans!! He, just like those people who brought him here all said the same thing though. "The hand that rocks the cradle is the hand that rules the world." Just as they are causing deterioration and discentagration of our neighborhoods and business they are doing the same to our children, all in an effort to take control of the United States. This isn't just a regional problem. Look around, it's everywhere there's a big city! Look at the mayors of those cities, the things the unions have done there that helped the problem along, the banks, politicians, etc. The reason this current administration is so eager to tear down and demolish our heritage is the same reason why Muslim countries have done the same to the people they conquered. It was done to the native American Indians as well though they tended to murder Indians along with their heritage or just mold their children into good little slaves for their society. The same people who've done this to blacks, Indians and others are the same ones in the current administration today. If people would remember history it would not repeat itself!